Kidd Upstairs – "Andrew Wiggins"
As 2013 drew to a close, LA based rapper Kidd Upstairs was celebrating the end to one of his most productive years in his short career so far. the Los Angeles based rapper and producer released his KVSHMIR mixtape at the end of last summer, to heaps of praise from fans and critics alike, which was a project backed with some really slick work on the boards from the likes of Harry Fraud and Pete Rock as well as some hunger-based rapping from the upcoming starlet. Kidd has decided to drop a single to lead us into 2014, and not only is the song title associated with someone who is tipped to have an amazing year, but the track itself is a certified banger to kick off the new year in that turnt up manner! Backed by a trap-influenced backdrop produced By Matty G, which has hard hitting kicks and deep 808's beneath a piano line that almost borders on creepy sounding, Kidd compares himself to Wiggins, as they both aren't earning a lot of money, but they know that all the time and practice they put into perfecting their craft will pay off in the end. 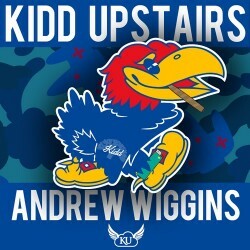 "Andrew Wiggins" is another track that shows Kidd trying to show kids growing up that hard work and dedication pays off, which is certainly a breath of fresh air in the current hip hop climate. With March Madness fast approaching us, and with Wiggins averaging fifteen points a game, it's no secret that 2014 is going to be a big year for a him. I believe Kidd Upstairs is leading a parallel life, and there's no doubt in my mind that the next twelve months are going to see him go from strength to strength. You can stream "Andrew Wiggins" below, and be sure to keep your eyes and ears locked onto EARMILK for the latest music from Kidd Upstairs.